The Spillglop® range of vessels is designed for recovering hydrocarbons on the high seas (black water). They can also act as supply vessels, ensuring profitable use during monitoring periods. 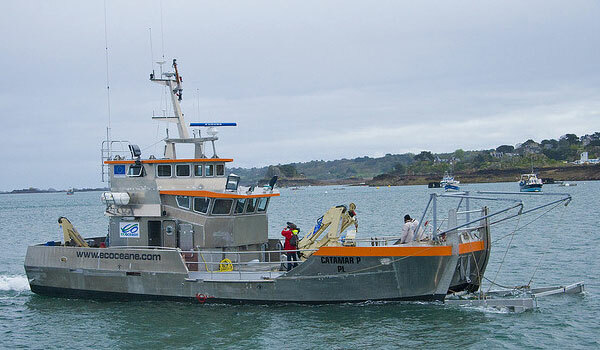 The vessels work at 4 to 5 knots in winds of up to Force 5 or 6, cleaning a surface area of 35,000 to 60,000 m²/hour. They can sweep up to 150m3 of hydrocarbons per hour, without creating an emulsion, transferring the collected pollutants into tankers astern of them as they work. Rotating these tankers, the vessels have an unlimited recovery capacity. In order to combat chemical spills, absorbents can be carried on board and spread on the pollution using the fire-fighting water cannon. The interior living quarters are fully protected, making it possible to work 24/24 in polluted areas. All boats are fitted with a “keel cooling” system, which is used both to cool the motor and to heat the hydrocarbon separator.